My Easter Sunday will be spent taking part in our family’s chocolate egg hunt around the garden (tempest and ice-storm permitting). This highly competitive and occasionally combative sport might look a little odd to the outside eye, as we have more pensioners than pre-schoolers on the starting line these days. But traditions must be preserved and scores must be settled, so it seems set to continue for a few years yet. Without getting into a debate about what the festival means, I hope you get some time to share a meal (or egg hunt) with family and friends. 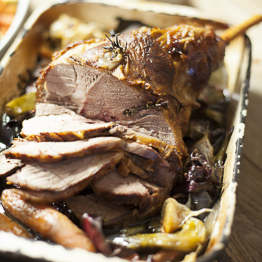 Our Easter hampers have sold out, so many of you will be cooking our roast leg of lamb. We’ve given you two ways to cook it – slow-roast or traditional, with home-made mint sauce. Cut several slits in the skin of the lamb, just large enough to poke in a clove of garlic and a small piece of rosemary in each. Season the lamb well with salt and pepper. Preheat the oven to 150C. Place the prepared lamb in a snug fitting roasting pan and cover with foil. Roast for 3 ½ hours, basting every 30 mins. Remove the foil and roast for another 30 mins to brown the skin a little. Preheat the oven to 220C. Put the prepared lamb in a roasting tin and put in the oven. Roast for 20 mins, then turn the heat down to 190C and roast for 50 mins for medium-rare lamb, or longer if you like it more well done. Traditional roast lamb should be wrapped in foil and kept in a warm place for 20-30 mins before carving to let the juices settle and tenderise the meat. Once the lamb is removed from the pan, skim off most of the fat from the remaining juices. Place the pan on the hob (make sure it’s a flameproof pan, or decant the juices into one) and stir in 2 tbsp plain flour. Stir for a couple of mins to cook the flour. Add a good glass of red wine and 1 tsp redcurrant jelly. Stir for 1 min, then add 300ml stock. Simmer for a few mins. Put a large handful of chopped fresh mint leaves in a heatproof bowl with 2 tbsp sugar and 2 tbsp boiling water. Leave to cool, then stir in 2 tbsp white wine vinegar. Leave to steep for an hour or so if you can. 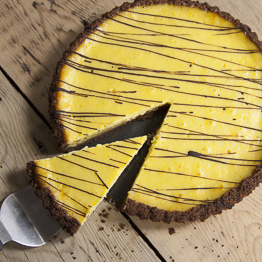 If you’re not tucking into our homemade Bakewell tart on Easter Sunday, or have inadvertently eaten it already (easily done), I hope you try making our lemon curd and chocolate tart, to see the recipe click here. It was one of the most popular things I’ve ever brought into the farm office for staff to taste test. There’s no requirement to make pastry, and the curd is easy to make; just remember to keep the heat low so it doesn’t curdle. Pop any leftover curd in the fridge and spread on a thick piece of toast for an indulgent breakfast or afternoon treat. Better than a chocolate egg (and I may not find any).